Tags: Fredrik Andersson, WPT Amsterdam. Posted on Friday, May 15, 2015 by "T". Day 1A chip leader Fredrik Andersson is once again back at top of the chip counts after a successful run on Day 3. 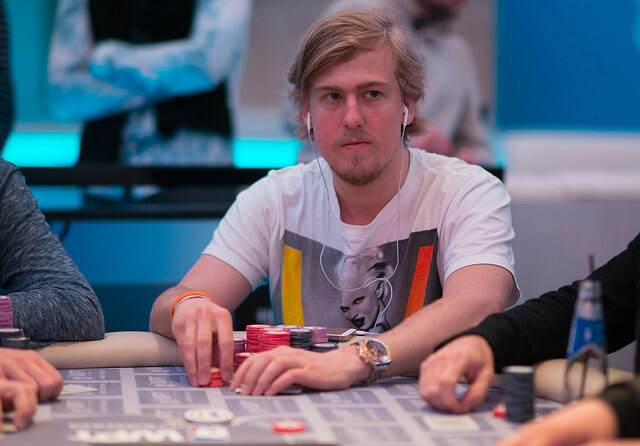 The Swede bagged up 1.4 million chips at the end of Day 3 - almost 400k more that his closest opponents (the only other players with seven figure sums) Day 2 chip leader Joep van den Bijgaart in second place and Sorel Mizzi in third place. Among the remaining 16 players who will return today one can find, besides the players already mentioned above, notables such as WPT Champions Club member Giacomo Fundaro with 849k in chips, and WPT Amsterdam High Roller winner Jason Wheeler with 584k. The remaining players are now guaranteed to take home at least $16,365 each - but, of course, everyone will aim to make it to the final table where a $239,559 first-place prize is reserved for winner. We will be back with a final table recap on Mondy morning. 7 comments for "WPT Amsterdam: 16 Players Left - Andersson Back in The Lead"
The last I saw of this tournament Sorel Mizzi had taken the chip lead overtaking Andersson but stacks are very close and there are a couple of local players close behind. Wheeler is still in a good position and has lots of experience. since i have no idea how to use the all knowing powerhouse simply known as search engine, i have to wait for monday morning to find out whether Fredrik Andersson managed to win this epic tourney or not. thing is that Fredrik Andersson is surely destined for a serious payday. go Fredrik Andersson go. Spoiler alert for pochui....do not read if you want to wait for the official news on Monday.....anyway your man Andersson failed to make it to the top of the podium in this,in fact he missed the podium altogether and got 4th place.Local boy Farid Yachou won. thanks for the warning. i haven't read any word after "Monday"
Farid Yachou started the final table with the second shortest stack. Jason Wheeler was the only player who had less chips, and the American would be the first player to hit the rail. I don't think a poker tournament is something you could spoil off from each other. If you are frequent on other sites you might see the news/articles about these before BRM gets to them every Monday, but on the other hand it's totally not that interesting who wins and who fails anyway.